Welcome to my stop on the By Hand Blog Hop! 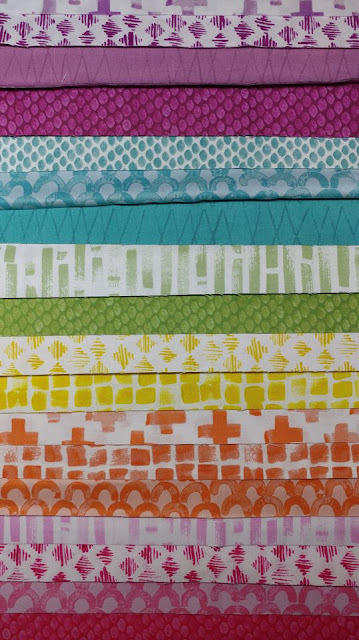 By Hand is a new fabric collection from Contempo designed by Amy Friend of During Quiet Time. The fabrics are in quilt shops now, so be sure to visit your favorite quilt shop and ask for them! The bright rainbow palette immediately drew me in! Amy designed the collection to have a light and dark of each color - and I wanted to make something that captured that! Way back at the dawn of Pinterest, I pinned a technique for twisted strips. I keep a mental list of techniques I someday want to try, and when I saw the By Hand fabric, it was the first idea that popped into my head! Jayne who blogs at Twiggy and Opal has been doing some amazing things with twisted strips too! 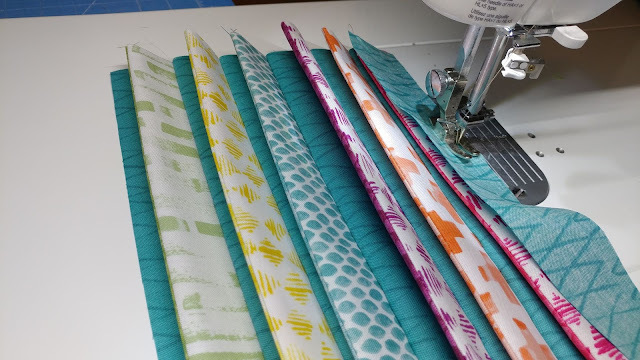 I cut 1 1/2" x 12 1/2" strips from each fabric, then sewed a light and dark together. 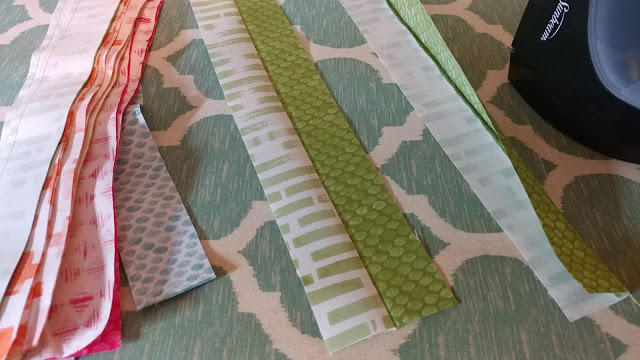 I pressed each set wrong sides together to create the reversible strips. I decided on a color order that spread out the warm and cool colors instead of the typical rainbow order. 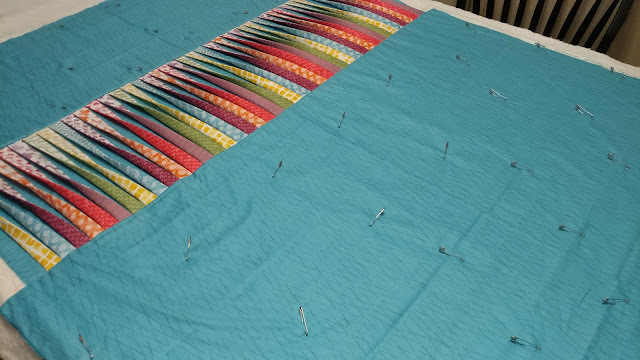 I started sewing the strips with background strips in-between, but soon realized it would be very hard to quilt once finished. I decided to switch gears and do the twisted section quilt-as-you-go. I cut 3 1/2" x WOF strips from each fabric to create the quilt back. This time, I decided rainbow order was just what it needed. 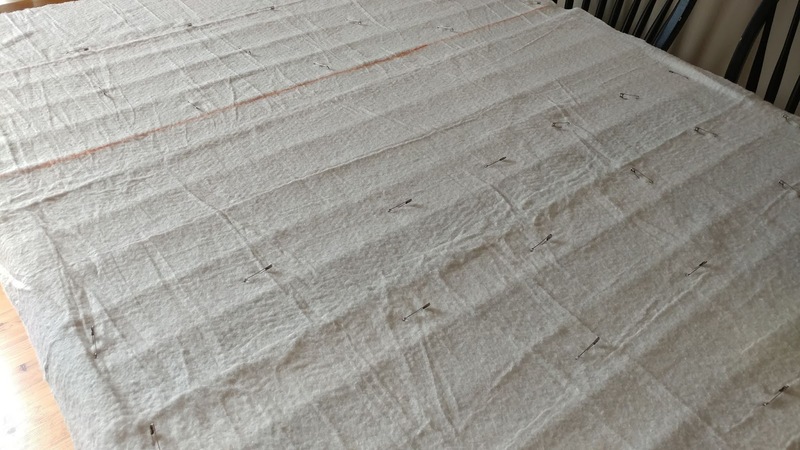 I pin basted the backing and Warm & Natural batting, then drew a horizontal line across the batting to use as a guide for sewing the strips. This time, I used my walking foot to sew each strip on. 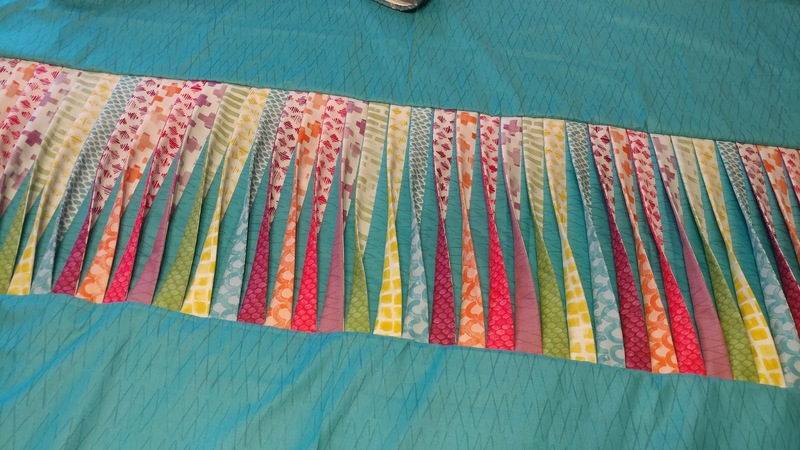 I sewed the reversible strip and a background strip on at the same time. 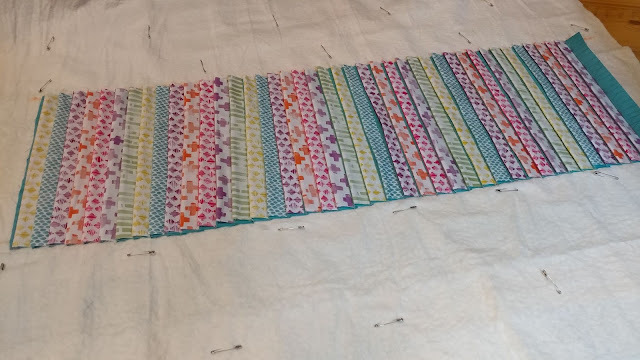 I continued adding strips until it was the same width as the backing. I used 50wt Aurifil #2605 Grey and backstitched at the beginning and end of each strip to lock the stitches in place. This created a bit of a "bird's nest" on the back of the quilt, but I'm not the type to take the time to bury individual threads! I know the stitches are secure, so I'm satisfied! Next, I sewed the background piece to the top of the strip section, making sure each strip laid nicely with the one next to it. When sewing the background piece to the bottom of the strip section, I "flipped" the end of each strip over as I got to it so that the strips would be twisted. It worked perfectly! Once the top was finished, I had to un-baste the backing and batting, then re-baste the quilt so the top would be pinned too. Using the same 50wt Aurifil #2605 Grey, I quilted a medium-sized stipple or meander over all of the teal background fabric. I finished the quilt with machine binding. 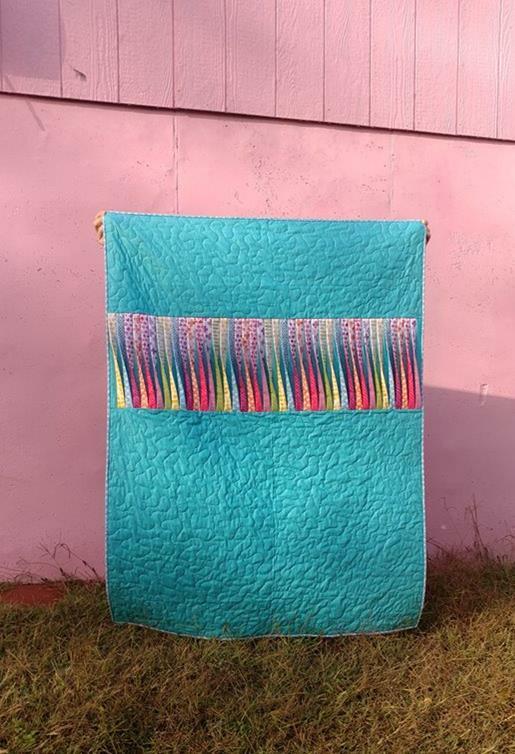 This quilt is my 53rd quilt finish for the year!! The quilt measures about 42" x 54" - a great lap quilt size. I wish you could see and feel the texture of this quit in person! It's my new favorite! Tuesday 10/9 - Kari at Craft Happy AND Laura at Slice of Pi Quilts <--- That's me! Now for the giveaway! Giveaway now closed. 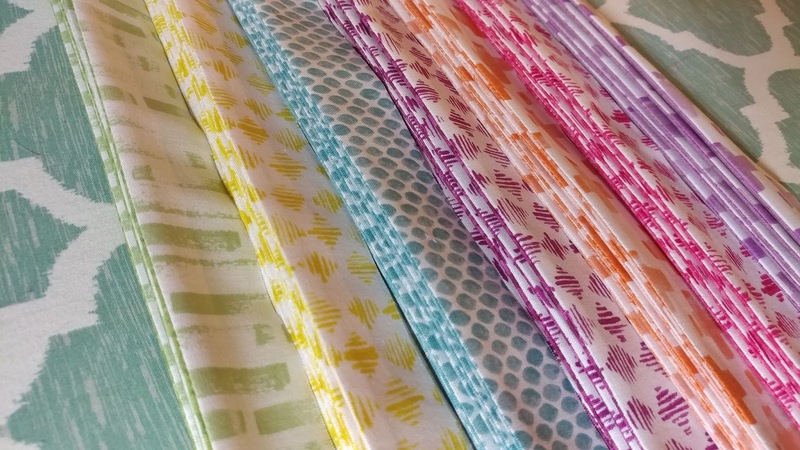 Benartex is generously offering a fat quarter bundle of 8-10 of the By Hand fabrics to give away! Just leave a comment on this post telling me your favorite fall activity. (And PLEASE leave your email address in your comment if you think you might be a no-reply commenter. Otherwise I won't be able to contact you if you win!) (Giveaway is US only and ends 10/13). Linking up with Main Crush Monday at Cooking Up Quilts, Monday Making at Love Laugh Quilt, What I Made Monday at Pretty Piney, Linky Tuesday at Freemotion by the River, Let's Bee Social at Sew Fresh Quilts, Wednesday Wait Loss at The Inquiring Quilter, Midweek Makers at Quilt Fabrication, Needle and Thread Thursday at My Quilt Infatuation, Finished or Not Friday at Busy Hands Quilts, Can I Get a Whoop Whoop at Confessions of a Fabric Addict, TGIFF at Pretty Piney, and Friday Foto Fun at Powered by Quilting. Besides leaf watching my favorite fall activity is making apple butter. My husband loves it and he is always willing to help. Making the apple butter makes the house smell so good! Beautiful quilt! Love the back as much as the front! My favorite fall activity is taking leaves. I Get such a feeling of accomplishment when it is all done. my favorite fall activity would have to be walking all over our farm and country roads. I'm always snapping photos with my phone. my next favorite activity is making caramel corn and chocolate chip cookies in anticipation of little trick or treat visitors on Halloween evening. I love picking apples. OK 53 quilts for the year is a lot. This quilt is wonderful. I love the color. I will send others to your site. I dropped 22 off for the Women's Shelter a few weeks ago and everyone laughed and said , "Do you every sleep?" I don't keep count anymore but I'm guessing I'm close to your 50. Have fun. Fellow blog hopper, Rachel, here! 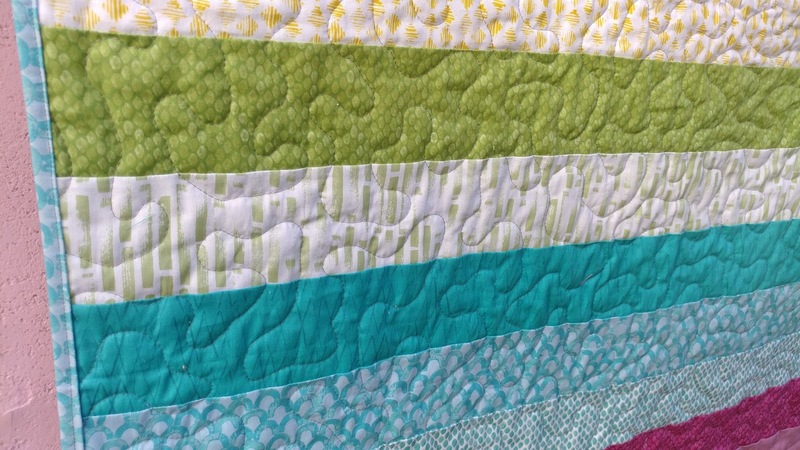 I don't need to enter to win, but I just wanted to say how much I love this quilt! I've been wanting to try the twisted block too! Now I'm feeling really inspired! And I love how you used the warm and cool colors for each side of the twist. Great work! 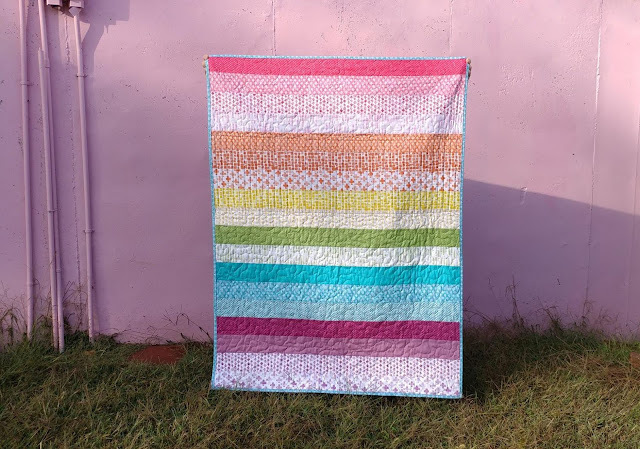 I adore the colors in this line and how you used them in this quilt is perfect! I love walking through crunchy leaves in the fall! Your quilt is so clever! I love the colors in this line. This turned out beautiful! Love the colors and the fabric is divine! Your quilt is so beautiful! I love this new line of fabrics! :) And I love hiking in the fall. The fabric twists are so fun! I love the way that they work with the light and dark pairings that I had planned for the collection. It's lovely! Thank you for making it. What a cool effect! I love eating pumpkin bread (if that counts as a fall activity)! I love the beginning of football season. Very cool! I love what you did with the prints! The texture is really fun. I picked up on that light and dark with those fabrics too. Your quilt is amazing! My favorite fall activity is hiking in the beautiful nature among all the awesome colors! I love going to craft shows this time of year. It takes a while for fall to arrive in Arizona. I like all the varieties of apples available right now. What a gorgeous quilt! I love walking through the woods in the fall and going for long drives. Thank you for sharing your amazing projects. I love walking and hiking in the fall. Love watching all the wild animals moving about AND of course spending time in my dewing room. Love your quilt.I just started quilting and I know it's going to be my new go to activity this fall! Love the effect of the twist on your quilt. What a fun idea! My favorite fall activity is going for walks on trails where all the leaves have fallen and enjoying the beauty of the changing seasons. I love watching the leaves change colors and carving pumpkins for Halloween. 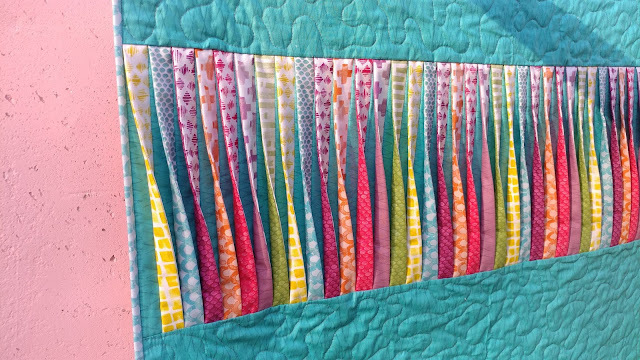 I love the 3-D feature of your quilt, and the color change that it adds. Favorite fall time activity is camping out in the backyard. No mosquitos! I repeat NO MOSQUITOS!!! Also congrats on your 53rd quilt this year, and the year isn't over yet!! YOu're amazing! Love watching farmers work the crops, then deer starting to come around, leaves changing, weather cooling. Nature is beautiful. Makes my heart Happy! I love flying in our small plane in the evenings, now that it is slightly cooler here in Florida. Great quilt! Baking a pumpkin, and making a pie. Your quilt is Fabulous. Thanks for sharing. 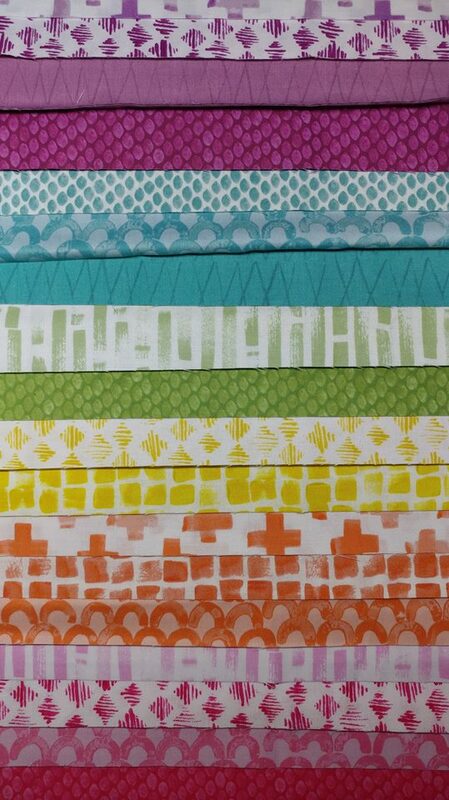 Your twisted strips really highlight the beautiful colors in this collection. I don't think it's an activity, but I just love to hear the rustle of fallen leaves in the breeze. Especially at night. I love to ride my horse in the cooler temperatures of autumn to see the leaves turning colors down by the creek. Nothing but the sound of his hooves on the dirt, wind whispering through the leaves, murmuring of what little water is left in the creek and the birds calling. So peaceful. 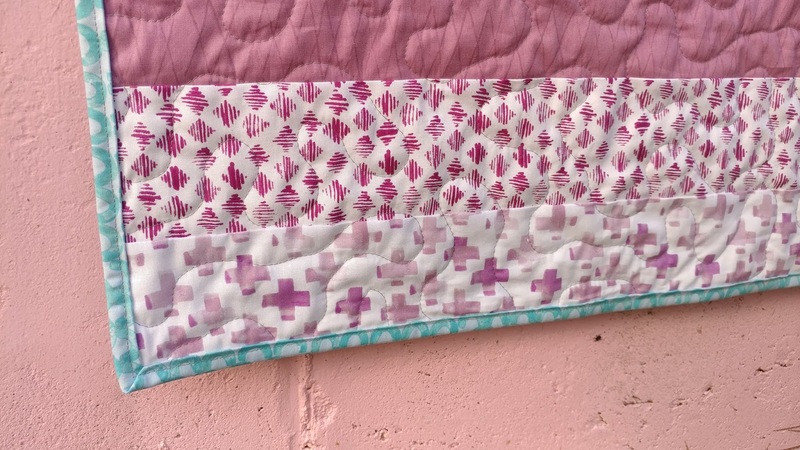 Love the quilt that you designed with these fabrics. It is beautiful!! Thanks for sharing!! This will be my next "must try" quilt! My favorite fall activity is picking the last of the apples off of our trees and making pies and apple crisp with them. The smell wafts through the house, and the smell of apples and cinnamon just warms my heart. This is breathtakingly clever! And beautiful!! We’re entering my 5th New England fall, having moved from Arizona and every year, I love setting out with my dogs for walks through the gorgeous forests in the White Mountains. Such a soul-food activity, in preparation for the long winter months. My favorite time of year! love these fabrics and your quilt is beautiful. my favorite fall activity is eating pumpkin pie, muffins, and bread. Watching the leaves turn all the beautiful colors. Your quilt is gorgeous! I love laying out in the hammock wrapped in a quilt and reading a book while the leaves fall around me. Even better when my beagle climbs up in the hammock with me and keep me extra warm! Your quilt is beautiful! I love the fall colors. Quilting is one of my favorite things. It is way too hot here to want to sew in the summer. The heat just zaps your energy, even with the air on. Must be mental, but can't help it! Walking under the autumn leaves is my favorite activity in the fall. p.s. I love your quilt! Viewing the beautiful Aspen among the Pine+Fir here in the Rocky Mts.! Beautiful quilt! You always do a great job in putting new things out there for us to see. I like walking with our dog. We got him last year when he was about a year old and now when you tell him to walk slow it happens. No more being pulled. I like to go for walks in the woods in the fall. Love the fall colors! Your quilt is outstanding! What a clever quilt idea! And, a super cute baby! ;o) My favorite fall activity is going pumpkin picking with my granddaughters. This is fabulous! And apple picking and harvest fairs are my favorite things about fall. Thanks for the opportunity! Your quilt is amazing! I love when we have a warm fall (like we are having) and I can sit out on the patio drinking tea and listen to the beautiful rainfall! It's been raining several days but in the high 60's so it's perfect! I love to spend lots of Fall time at our cabin near Leavenworth WA. The days are sunny and the nights are crisp enough to put out all the quilts! Good light through the big front windows for sewing at the kitchen table. Beautiful quilt! I need to try that technique. =) Thanks for showing how you did it. My favorite fall activity is enjoying the cooler weather (finally!) down here in the south as I work on quilting projects. Thanks for the opportunity to win. Love your quilt - the colors and textures are wonderful! I love seeing all the different kinds of pumpkins in the stores - the textures and colors are such a nice mix. Your quilt is so pretty. And your baby boy is darling too! I love the crisp air and the smell of fall. It is so welcoming after the hot summer weather we have been having! What an awesome way to use the twisted strip technique; I like that your twists are double sided! What a clever idea your twisted strips are! My favorite fall activity here in South Texas is sitting on my front porch and enjoying the lower humidity and temperatures. We’re supposed to get our first taste this week! Baking anything is better in the fall. I love the smells of things cooking in the oven. Too hot to bake in the summer. 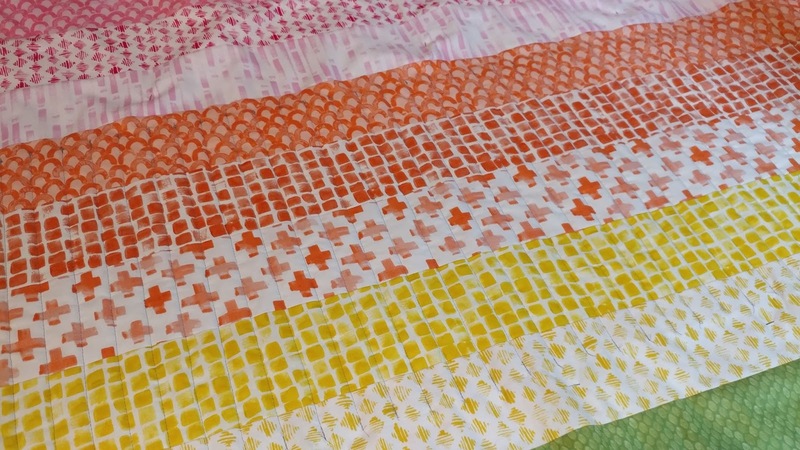 The quilt is beautiful and the technique is awesome. My favorite fall activity is hay rides. Fun times with friends. Your quilt is amazing! I have never seen this design before. Thanks for the giveaway. I love going to the Fall festivals. I never grew up, still can't beat jumping in the leaves! I love going to Ogleby Park and taking walks when all the leaves are changing color and hand feeding the deer that live in the park. What a beautiful quilt and a lot of work. Love the way you highlighted the aqua and didn't overwhelm it with the technique. Your model is so lovely...I'd like to cuddle him!! Love fall, winter and spring...I love to see the change in seasons...Summer is just too hot anymore. Congrats on #53! I love sitting outside in the (sometimes) cooler temps waiting for winter to come! Such a cute idea for your quilt!!! My fav fall activity is going for a drive to the North Shore, AKA Lake Superior. Oh my gosh how I love that quilt!! I guess one of my favorite things to do in fall is walk through our beautiful city park and take rides and look at the colors. Fall weather is just right to hike on the park trails. Great quilt with a wonderful "twist" to a simple design. Wow, that is amazing and so bright and happy! Your son looks good with it. I can't believe a month has gone by already! Thanks to you and Benartex for the giveaway. They are one of my long time favorite companies. Remember collecting the pins, or are you too young to have done that? My favorite fall activity ... driving around east Tennessee with my Nikon taking pictures of amazing color, fallen down barns and houses, and whatever other interesting things I find! Things are running late this year, but I hope that in a couple or three more weeks that I can take that trip around east TN! I love picking apples and making caramel apples for my family. Your quilt is absolutely wonderful!! I am so inspired! I hope to one day be as creative and skilled as you! I love to hike in the fall of beautiful Southeast Alaska. My favorite fall activity is walking outside. Your twisted strips is a fabulous idea and your quilt is beautiful. I love 3D quilts and I'm mentally filing away your idea. Laura, That's the first Ive seen Twisted Strips...so amazingly beautiful. THanks for the full tutorial. Love walking in Autumn, just the sound of the crunching leaves when stepped upon and viewing them fall from tree's as I walk gets me outside more. We love going for walks and seeing all the beautiful colors. The crunch of the fallen leaves is an extra bonus. Your quilt is beautiful and I was happy to see another baby picture. One of my favorite fall activities is quilting. I love to hand quilt when the weather gets cooler and I can comfortably sit and watch football with a quilt in my hoop. Oh my! Your twist and flip panel is so cool! I love the rainbow, curvy effect it gives...plus the texture! I can see why it's a favorite of yours. I love walking among the trees in the fall and swishing my feet among the crunchy leaves. 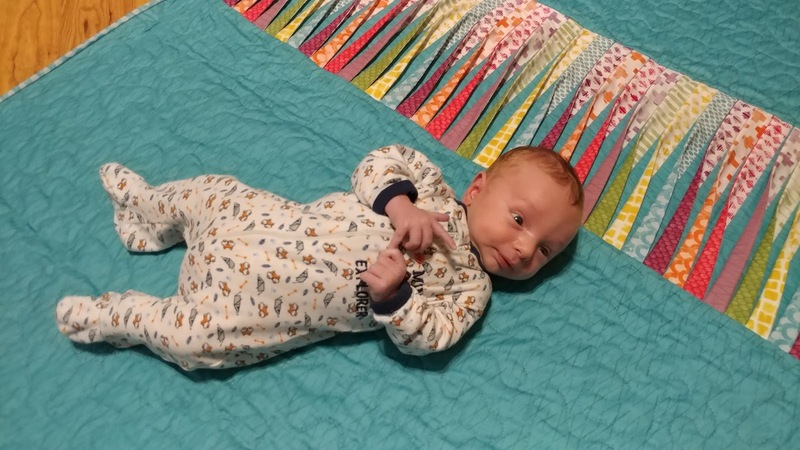 Love your quilt design & oh my - cute baby! My favorite fall activity is a road trip to view the fall colors. Love this quilt!! My favorite fall activity is baking! Especially with apples and pumpkin and lots of cinnamon. Love all the harvest festivals and craft shows. Love to make pumpkin pies. My favorite fall activity is walking thru the leaves with my granddaughter. My favorite fall activity is driving and looking at the changing colors in the leaves. Going to the pumpkin patch is what I look forward in doing during fall. Giving my slow cooker a run for its money! I like going for a drive to see some of the beautiful Fall colors in the trees and landscapes! My favorite fall activity is a walk in the mountains on a crisp autumn day to see the beautiful fall leaves. Enjoying cinnamon powdered donuts with apple cider,fresh from the tap at the farm stand. I love going for bike rides on a beautiful fall day in Boulder, CO! I love to hike in the woods when fall arrives. 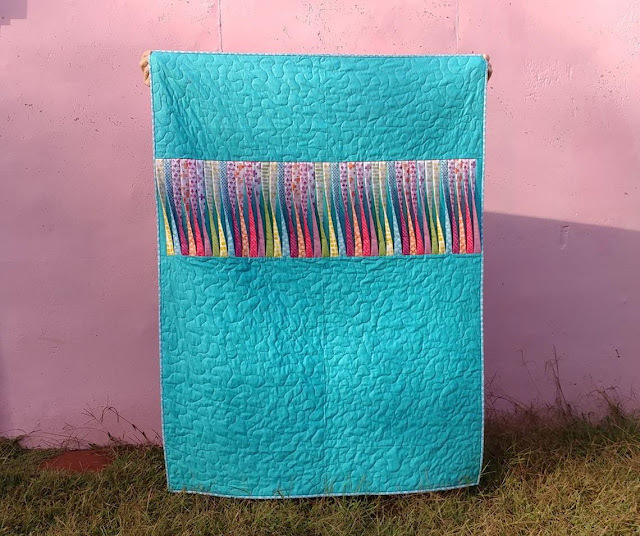 This is SUCH a cool quilt, Laura! I've been wanting to try twists and was a little intimidated by Jayne's tiny ones. Seeing your gorgeous twists in a larger scale gave me that "Aha!" moment. And seeing the quilt with a happy baby on top is the icing on the cake. Cool quilt. Thank you for showing us how you made it. Congratulations on your sweet baby. What a great quilt! Thanks for the very clear instructions on how to make those strips twist. 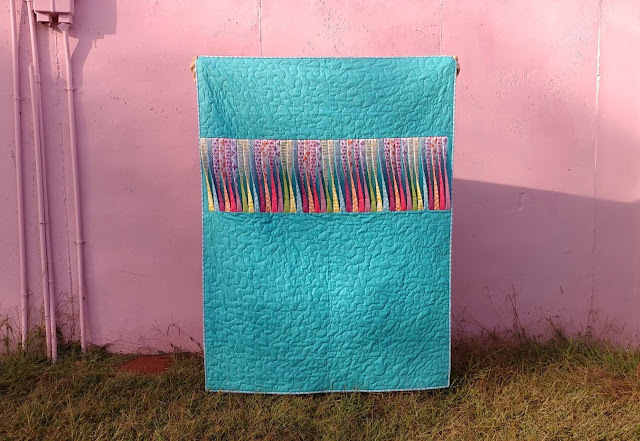 This technique is now on my bucket list of quilts I want to make. My favorite fall activity is walking through wooded areas and enjoying the color change in all the leaves. Such a beautiful quilt! My favorite fall activity is just enjoying the coolness in the air and all the colors of fall. I love going for walks when it's just a little cold. The trees are so beautiful when the leaves are turning colors. I love the little flip in the fabric - nice touch! And the baby in the photo is priceless! Best thing about fall is watching the world turn into a kaleidoscope of orange/red/yellow/green in celebration of such a job well done! Hum, fall activities... we go down to our beach house that we've rented out all summer. October in Nags Head, NC is so lovely. I do a bit of sewing in the morning and go out in the afternoons to see the sights or do some shopping. I used to like to pick apples but haven't done that for years. Your new quilt is fabulous. Thanks for the detailed info on how you created the twist. Beautiful quilt and beautiful baby. Beautiful fabrics. I love teal. This is so cool, Laura -- LOVE the texture, especially for a baby quilt! Those tiny curious fingers are going to love stroking the twisted fabric strips on this quilt. And this is your FIFTY-third finish of the year?!! Very impressed! I made a couple of cushions using that method a while ago and loved them as did the recipients. It looks even more effective on a quilt. Well done. Oh wow! I love your twisted strips! 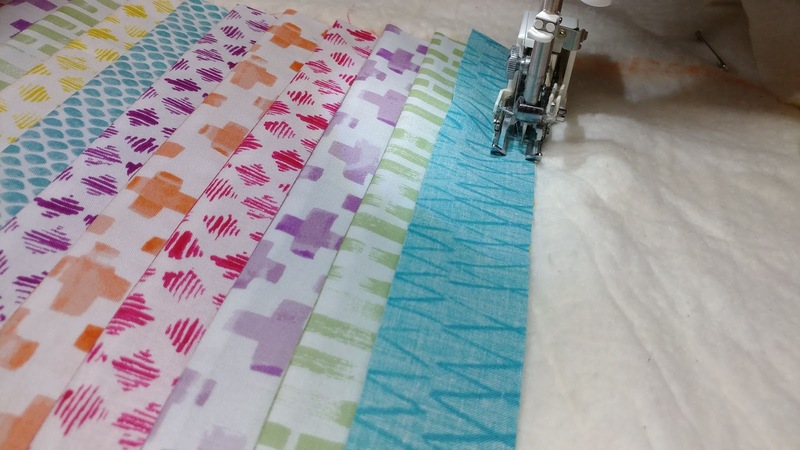 I'd love to try this technique in quilts and bags and pillows! Thanks for sharing this. My favorite fall activity is visiting apple orchards. In Pennsylvania Fall waited until this week to make an appearance. There are a few sugarmaples showing their best colors. Fall is my get it in gear time as ski season is just around the corner. Time to get fit and return to the sport I love. This time of year brings a wonderful schedule of quilt shows. It fills me with joy to see the splendid work of so many folks all in one place. I love going to pick out mums and pumpkins so I can decorate my house and porch with them. Fall is a favorite holiday of mine. I plan to make a fall quilt also, so my house will have more fall indoors. Sitting around a fire pit roasting hot dogs and marshmallows...s'mores may be involved if we can wait long enough to put them together without eating all the marshmallows ;-) Then enjoying friends and family chats under quilts with beverage of choice...your twisted strips quilt would be a first pick for our group! I love walking my German Shepherd, Zack, along our dirt roads with all the maples turning bright red this time of year. 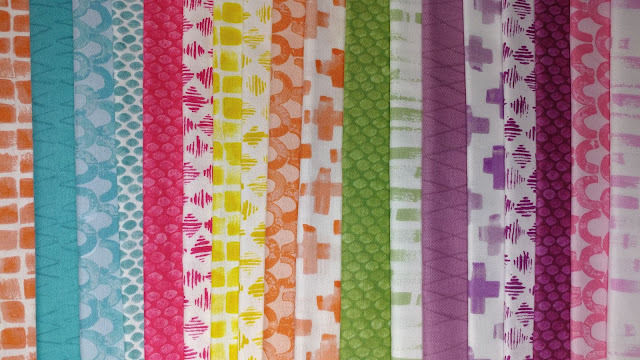 Very pretty fabrics - like walking into an ice cream shop! Love what you did with them too! You do the most amazing things with fabric. What a creative mind you have! And that particular fabric line couldn't be more perfect. Thanks for linking up to TGIFF! !